Few mangrove branches cut by them, two knives and 2 axe used for cutting mangrove were taken into naval custody. The suspects are residents of Mannar area in the ages of 43, 38, 31, 29,27 & 19.Officers of Wildlife Conservation Department conducts further investigation on arrested suspects and mangrove poles. 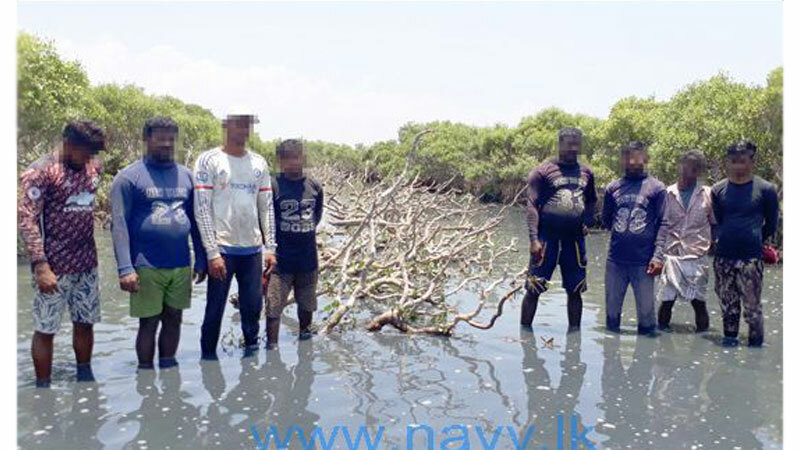 This mangrove eco system which is an authentic resource activate against the soil erosion, is destroyed only by very few people and SL Navy keeps a watchful eye on such groups to foil their attempts and to enforce the law against them. Further, Sri Lanka Navy has launched several projects successfully to replant the mangrove around the lagoon areas of the island. Especially, at present, these mangrove replanting projects are being actively maintained in Northern, North Central, North Western and Southeastern Naval areas.The main objective of these projects is to conserve and protect the coastal belt around Sri Lanka.